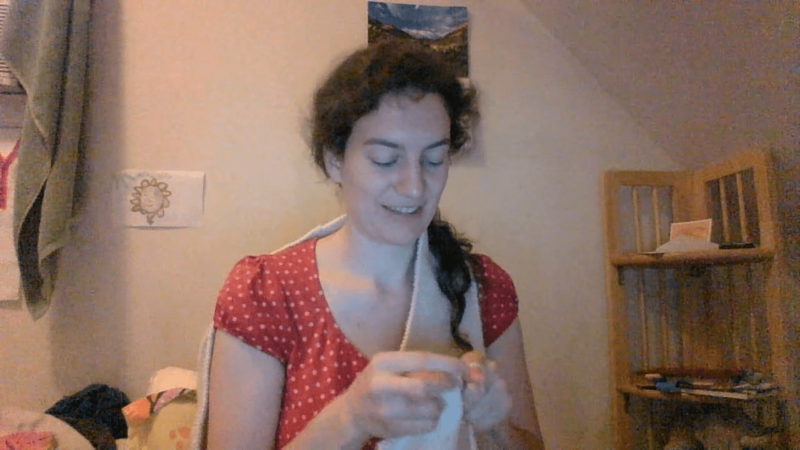 While I was pondering what to write for my first blog post, I closed my eyes and saw what I have seen so many times that it has become my go-to image of her: my younger sister knitting as we visit, in person or over Skype, unconscious of how beautiful a picture she makes. And so I begin my celebration with knitting. 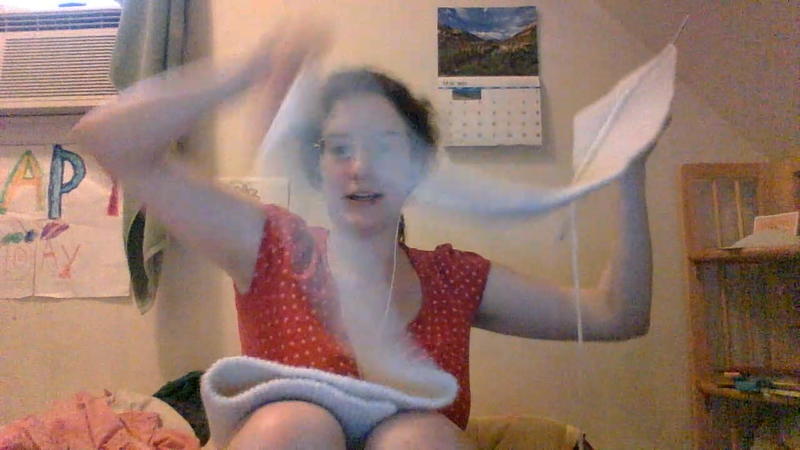 Aurora Skyped me to talk about knitting, and, as usual, she brought out her latest scarf and began to knit. 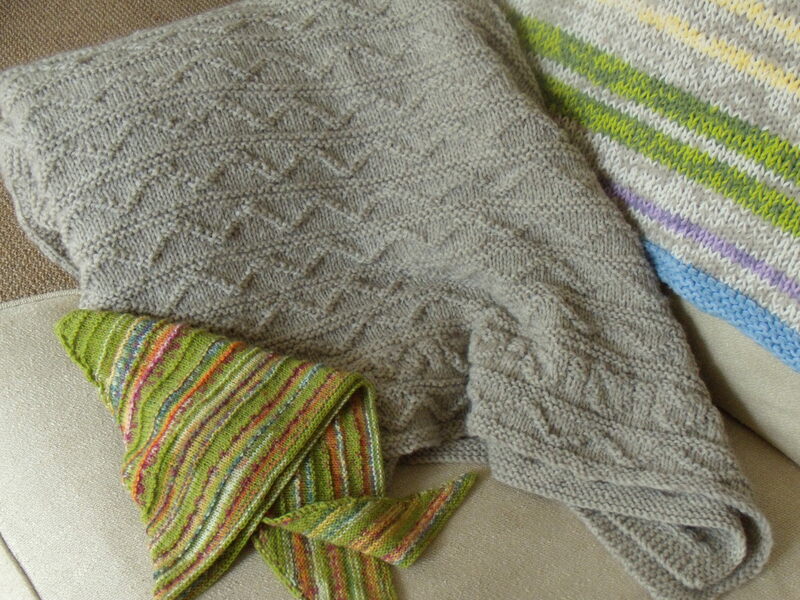 I have seen her working on an array of them over the last couple of years, of varying colours and widths. Aurora says she has always loved the idea of knitting. She enjoyed knitting in sewing class at the Kempton New Church School, taught first by Anna Volden, and then by Annina King. She says knitting is a way to have chill time while watching or listening to something, and it’s fun to give away the final product. She’s chosen scarves because they’re easy, just the same simple stitch, so she doesn’t have to watch what her hands are doing. She likes having something useful to do: she estimates that she’s given away about fifteen of these scarves so far. She likes bringing knitting to low-key social events. It helps her be more peaceful, instead of wondering what to do with her hands other than eat. If she’s ever with a group of women who are working on their own handwork, having a knitting project to pull out while they chat helps her feel part of things. Aurora’s knitting is even and her scarves close-knit, but they are soft and sproingy rather than tight. The scarf I knitted in third grade for sewing class was uneven and stretchy, and never very useful for keeping the cold out, but Aurora’s scarves, put once around my neck and crossed under a coat, are incredibly wind-proof on the bitterest winter mornings. She gave me the below scarves recently, I couldn’t decide on which colour I wanted, so she lavished me with two, and I used them almost daily this last winter. By happy accident, the red scarf matched my favourite hat exactly, also knitted for me by someone beloved: “Aunt” Kathy Schrock of Kempton, PA. I was visiting Kathy a couple of years ago while she was spinning wool into yarn on her new spinning wheel, a present from her husband Roger. I exclaimed over it, admiring the shade of red, and a few weeks later she surprised me with this hat, for which she had also spun grey and cream wool. 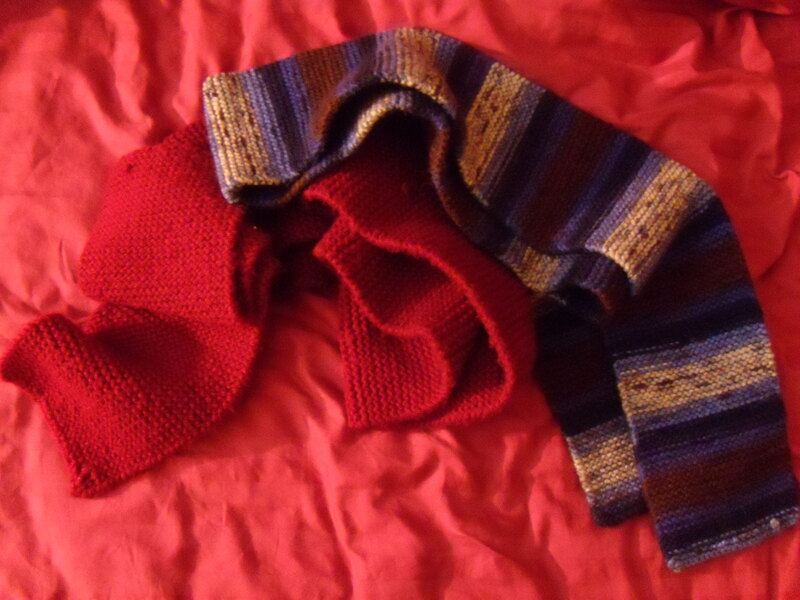 It was a very good gift, especially since it replaced another favourite hat, which I had sadly lost years before, also dark red, and also knitted for me by an “aunt” Joan Raymond of Toronto. Another knitter is my older sister Anastasia Show, who lives in Bryn Athyn with her husband Rich. Often when I go over for an evening visit, I find that she has finished the last project I saw her working on and has started a new one. 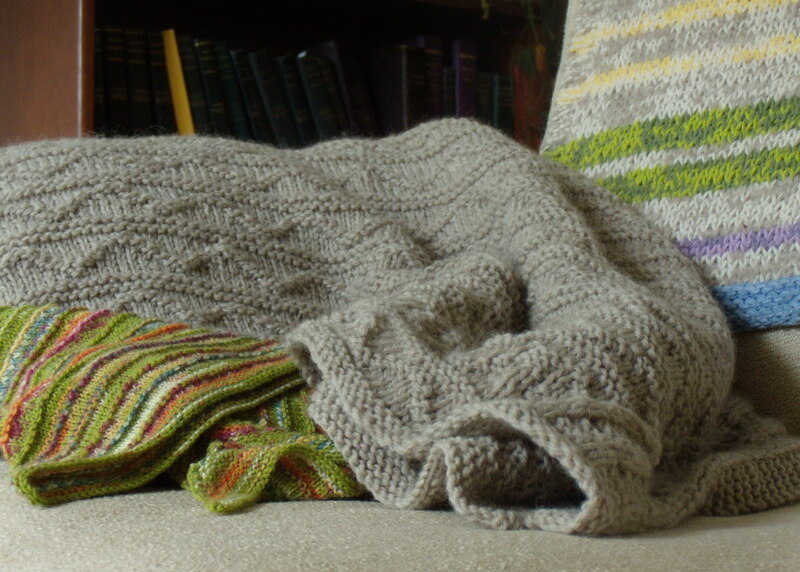 I cosy up in one of her thick wool or cotton yarn knitted blankets as we talk about many things, and she tells me about what inspired her current handwork project. She has made various yokes, shrugs, and other pretty things to wear, and I love seeing how she takes a pattern she’s found online, and make it her own. 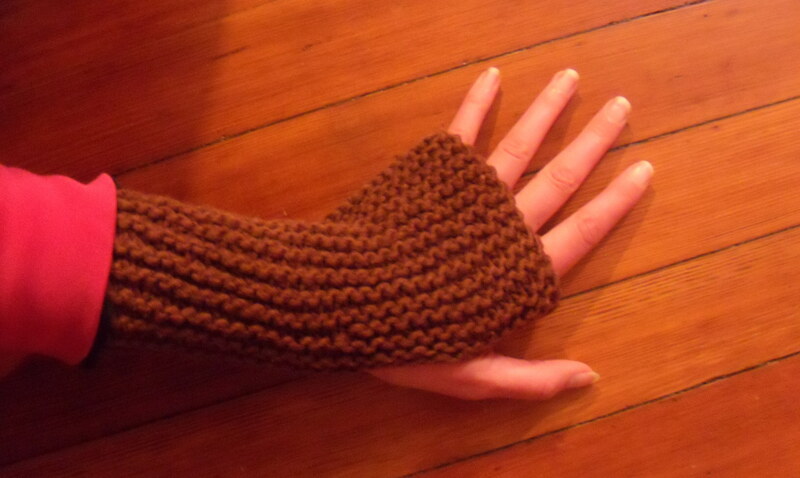 I asked her what she likes about knitting, and she answered: “I like that I can make something beautiful and/or useful. I like making things from natural materials, using something from the natural world, and transforming it by my own efforts into something else.” Sheep’s wool, for instance, initially keeps sheep warm, but it can also be transformed for human use. 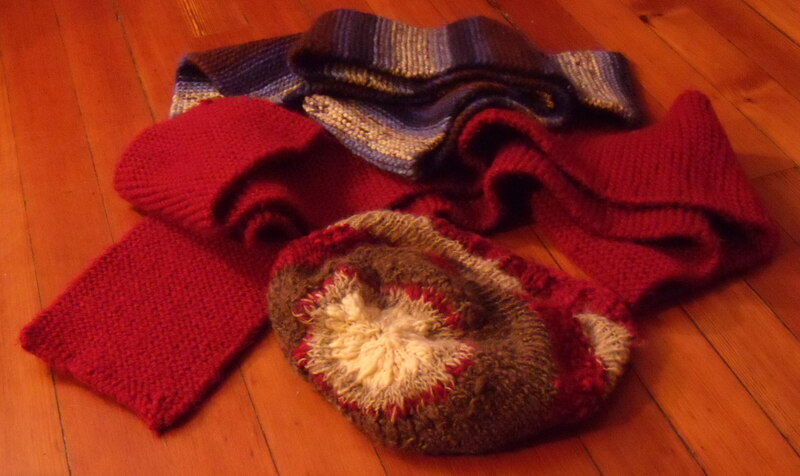 One doesn’t have to be a knitter oneself to benefit from the sphere of it. I get plenty of vicarious enjoyment by sitting with my sisters while they work and wearing their creations. Clearly the finished product is not the only use to come out of the knitting process. Most of us can afford to buy factory knit items, yet many women who don’t have to make blankets and clothes to keep their families warm, still choose to take up handcrafts. And even women who do have to make them, choose to put in extra, precious time in making them beautiful. Gifts that are made while woman visit each other are given to warm the bodies of family and friends for years to come. Knit, weave together, sew up, mend—it’s no accident that the words for handcrafts are used for relationships and communities. ” The things women create need to be celebrated because they’re not the sorts of things that make headlines, and yet they represent the sphere in which we are nurtured.” -Well spoken, Ayisha. I love reading this and thinking about preparing for the fall (in Pennsylvania). There is always something so knittty about it. This reminds me of how I always love books about houses and homes, from “Brambly Hedge” by Jill Barklem to “Home” by Witold Rybczynski. Hands knitting together society. Love this. Brambly Hedge. Autumn. Knitting. mmmm.